The 2014 CMA Music Festival will boast more than 50 artists during a series of free daily concerts at the Chevrolet Riverfront Stage. Big & Rich will launch the riverfront concerts on Thursday, June 5 at 10 a.m. CT.
Additional performers scheduled to hit the Chevrolet Riverfront Stage include Frankie Ballard, Danielle Bradbery, Kristian Bush, Craig Campbell, Jason Michael Carroll, Terri Clark, Billy Ray Cyrus, Dan + Shay, Tyler Farr, Colt Ford, Gloriana, LoCash Cowboys, Lonestar, Love and Theft, Dustin Lynch, Craig Morgan, Lorrie Morgan and Pam Tillis, David Nail, Jon Pardi, Parmalee, Eric Paslay, Kellie Pickler, Cassadee Pope, Collin Raye, Chase Rice, Maggie Rose, Corey Smith, Cole Swindell, The Cadillac Three, The Swon Brothers, Uncle Kracker, Clay Walker, Darryl Worley, Charlie Worsham, and Wynonna. 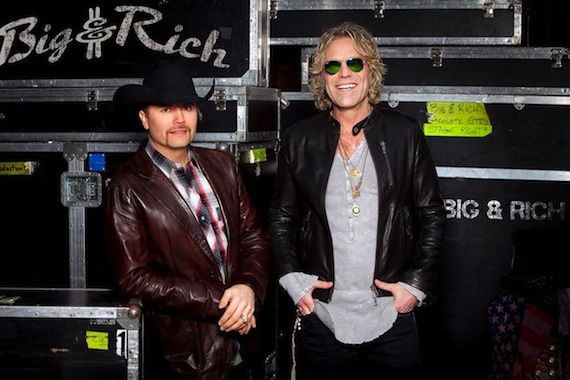 “Big & Rich will bring a great energy to the official start of the Festival, and I know our fans will not want to miss their performance,” said Sarah Trahern, CMA Chief Executive Officer.